Battambang: A man was attacked with an ax on December 3, 2018 at Oudlup Village, Boeng Raing Commune, Kamrieng District, Battambang Province. 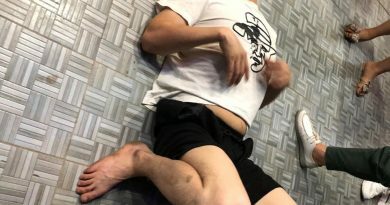 A Thai man, Sak Pangpokpai, 42, took an ax to a Cambodian man, Heng Kimhanh, a 27-year-old Cambodian, causing injuries. The reason behind the assault is unknown, but it is believed both men worked together.